As if seeing hilarious improv comedy AND supporting a great cause aren’t reasons enough to plan a morning out in December, check out the awesome menu Paradise offers for brunch! Don’t forget, reservations are required! Make them online at ParadisePianoBar.com or by calling 562-590-8773. When can you go out on a Saturday night and see great live entertainment and not pay a dime? Well, tomorrow night, actually. Held2gether is performing at Hot Java, and that means standing-room-only, totally UNCENSORED improv comedy. Oh, and great coffee served by the nicest baristas in town. 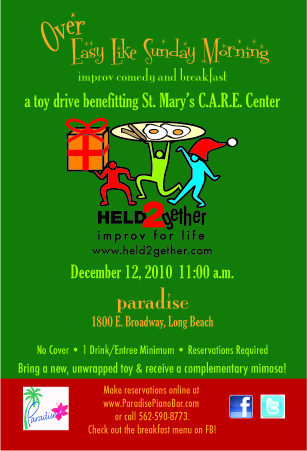 Held2gether is teaming up with Paradise Piano Bar to sponsor a toy drive for St. Maryʼs C.A.R.E. Program! We’ll tell you more about it as the date gets closer, but for now mark your calendars for Sunday, December 12th at 11 a.m. It’ll be a hilarious improv comedy show AND a delicious breakfast benefitting a great cause… with no cover charge! There’s a 1-drink-or-entrée minimum (that’s, like, so cheap!) and if you bring a new, unwrapped toy you’ll receive a FREE mimosa. Just our way of saying thanks. St. Mary’s C.A.R.E. Program is a non-profit organization “that helps meet the medical and social needs of the HIV community throughout Los Angeles County.” Held2gether is excited to help provide holiday gifts for children of families living with HIV who might otherwise have nothing to look forward to on Christmas morning. If you can only make it to one Held2gether show before the end of the year, please make it this one! It may not sound like it, but coffee, avocado sandwiches, a furniture warehouse, and theatre have unifying characteristic: the musings of Long Beach’s homegrown improvisation group, Held2Gether. Darren Held is the local pied piper of Improv classes, and if you caught the inaugural Studio Nights at LB Playhouse, any of the Last Laugh Saturdays at Hot Java Coffee House (on Broadway and Junipero, they have a show this Saturday, 10/23) or their own feature show, Overexposed! at the EXPO Center in Bixby Knolls you can vouch for the group of grown men and women that still embrace (or decided to return to) the craft of acting. Short and long form scenes, dramatic and comedic monologues, the members of Held2Gether bare their spontaneous souls for our enjoyment. In the spirit of “the more the merrier” Darren Held has opened up his doors and announced an array of upcoming Improv Classes, in part through the Long Beach Department of Parks and Rec, through the end of the calendar year! For more information on any of these classes and more, call (562) 537-8558, visit the website, or email to reserve a space. If you’ve ever seen a Held2gether improv comedy performance live (or watched one of our killer videos) you know how funny we are. No, really. We’re hilarious. Names. In improv scenes, the improvisors always give each other names. With the millions (billions?) of possible names to choose from, we could theoretically never use the same name twice. And yet, Barbi is partial to the name Jo-Jo. Jayme likes Teri for a girl and Toby for a guy. Sally is universally popular. If Barbi and Jayme are in a scene together and call each other Jo-Jo and Teri, the rest of us will crack up as if that’s the “funny” in the scene. The audience assumes we’re developmentally challenged. Physicality. In improv, we create multiple characters in a single show, each with their own physical traits. Still, we can predict: Jayme will end up on the floor. Sonnjea will gesticulate wildly with her hands. Robert will rub his belly. Waverly will pick imaginary objects off the floor. Jaimz will shout. The rest of the players will place bets to see how long it takes for one of these things to occur. The winner will buy drinks after the show. Characters. We all have characters that are easier to play than others. In any given show, you can be sure Viet will play an Asian character, Sean will play a gay character, Sheri will play a sexually inappropriate character, Paul will play an old man and Andy will play a confused old man. Playing these fall-back characters can still be a stretch for the performers, though. I mean, sometimes Viet plays a Chinese character, and sometimes he plays a Vietnamese character. Wow, what range! Now when you’re at the Hot Java show next Saturday, you’ll be in on all the inside jokes. You can thank me later.